This Labor Day weekend has been full of cool temps, just perfect weather. 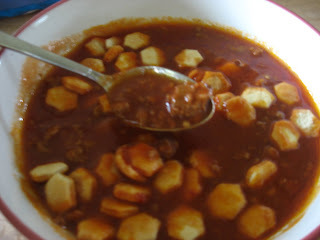 When cool weather hits, my mind immediately goes to comfort food, and this weekend that comfort was chili. Yeah, tomorrow is supposed to be back in the 80's, but I don't care. And isn't chili the perfect football watching food? I may have curled up with a bowl last night as we watched endless games on TV. As far as my chili recipe, it stems back from my mom's. I might make it a little different than her now, but trust me, I will never deviate. Don't send me your chili recipes, because honestly I won't make them. In a large stockpot, cook meat, onion, garlic and seasonings until brown (drain if desired). Transfer to a large crock pot. Add all other ingredients and stir. Set on low and cook as long as needed, the longer the better in my opinion. A few hours after cooking, taste test, and adjust seasonings if needed. Serve with crackers, shredded cheese, sour cream, etc. That is it! It is so simple, and the best part is once you make this you do not have to make dinner for at least another night, maybe two, it makes that much. I made chili yesterday, too! I couldn't resist with the chill in the air.